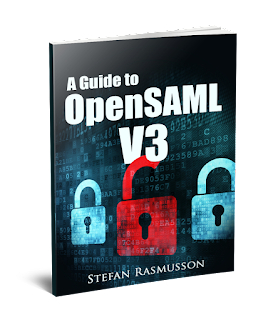 I have bought your book and with the help of that , i could integrate my web application using openSaml version 3. Now i have a different use case to implement , my company has a desktop application implemented in .Net , we want to enable SAML based sso for this application as well , i googled various sources but neither helped me . So we have arrived at our ow n idea to implement this. Sound like you could set a RelayState parameter on the SAML request URL going out. This should be echoed back in the response. However you should think twice on you acrobatics with the second servlet where you take in a assertion and return user id in the servlet response. If you blindly trust what is returned in the response it might be easy to by pass the authentication by just inserting another user id. Hi Stefan -- I'm using this sample code to decrypt an assertion from okta and it's not working out. would you have any advice? oh - got it solved by using a chaining resolver. though I'm not fully sure what happened. I have a similar issue on my system on my unit tests. I changed it to add the chaining resolver, but I still have the same error. Are you using the same key for both encryption and decryption like Stefan's example on the book?